The background video is a looping/muted video with no controls, so the video should be shorter in size/length. Then scroll down to HEADER BACKGROUND VIDEO (MP4/H264) and replace the text with an uploaded video or upload a new video. The video must be MP4/H264 formatted and should have a 16:9 aspect ratio. The background video is a looping/muted video with no controls so the video should be kept short in size/length. It is recommended to also upload a header image. The header image is used for mobile devices and will display on a desktop computer while the video is loading. We recommend using a still image from the first fiew sections of the video as the header image. 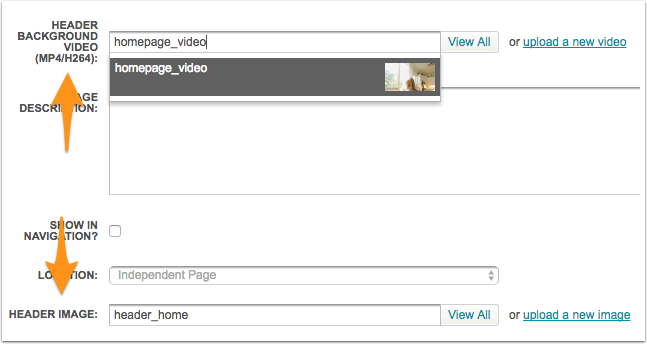 A background video is available to any page that includes the section HEADER BACKGROUND VIDEO (MP4/H264) in the page editor. Just go to the desired page editor and follow the same steps listed above.